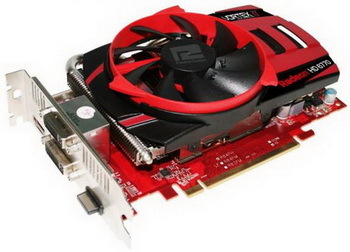 HD6770 with PowerColor’s distinctive Vortex II GPU cooler. The 6700 series video cards from AMD are based on the previous 5700 series and is in fact the second generation to use the newer 40nm design. The 6700 series cards represent one of the most optimized line of the 5XXXX series cards, second generation 40nm design nets us cooler cards that are faster and more stable then any of its predecessors while still enabling you to get the most out of your DirectX 11 games. One of the biggest things that separates the PowerColor version from the stock reference design is the unique vortex PCS cooling this cooling design is suppose to lower the temperature by 25% over the stock reference design. The cooling on the PowerColor version is raised much higher than the stock card and offers an adjustable fan that lets you control the airflow, this design is is PowerColor’s PCS+ Vortex II and in practice doesn’t generate undue noise while it keeps the card cooler than what the reference cards fan design would allow.